I hope over the last week you have been playing around with PicMonkey, becoming more familiar. 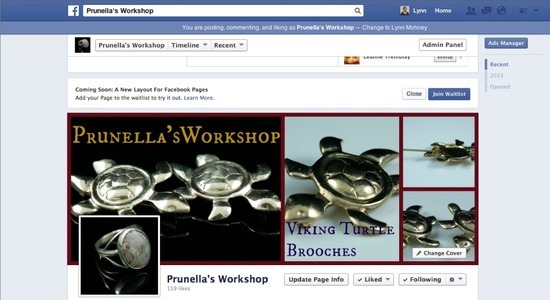 If you have, you may already be comfortable creating a Facebook banner of your own. If not, I am going to walk you through, step-by-step making a banner. 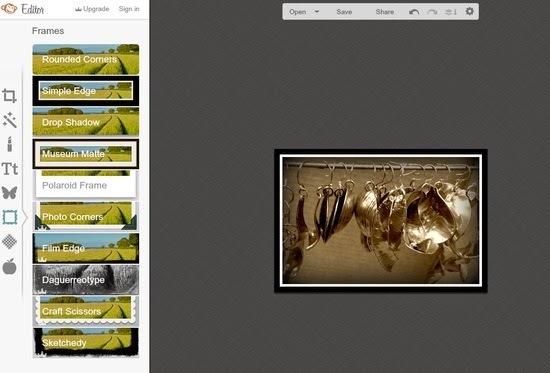 This tutorial will show you how to edit and resize a photograph, include your company logo, create a photo collage sized appropriate for Facebook, and upload it to your page. 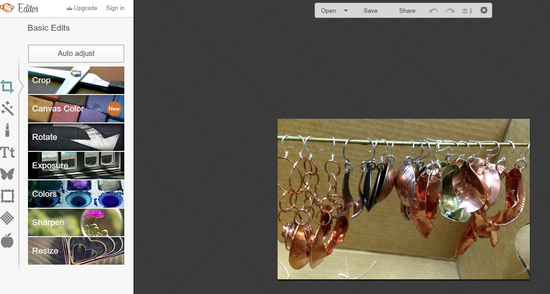 As I noted last week, you want to be careful editing product photos. The best solution is to take a perfect photograph with fantastic lighting, so that the only changes you are making are to the size and cropping of a photograph. However, if you, like me, are not a professional photographer, you may find you need to make subtle lighting and color corrections to make certain your photograph matches the actual product. This is not the time to correct mistakes you made during the creation of your item. Of note, a Facebook banner is not for the purpose of actually selling the item pictured. Instead, you are sharing what your business is all about. You may choose product you have already sold. Some artistic license is acceptable as well, as customers are not linking to your banner with the intent to buy what they see! Click on the Edit Icon. It will automatically bring you to the files n your computer. 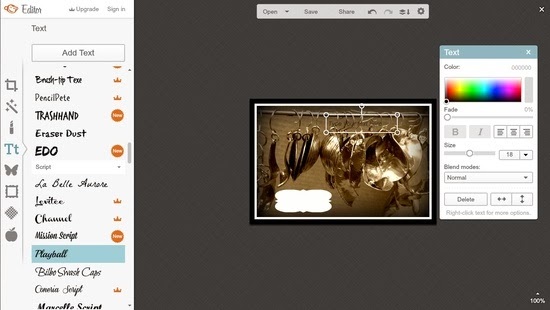 Find your photograph, select it, and click choose in the right hand bottom corner. I took this photograph using my camera phone. I like it because it has several pairs of earrings. However, it’s not the most visually exciting picture. Let’s see if we can liven it up a little without loosing the integrity of my work. I am going to start with the crop tool, so I can remove some of the cardboard box. A menu pops up on your left. There is a dropdown (currently states No fixed proportions) where you can choose pre-determined sizes. These are useful if you want to select a specific part of your photograph and have it scaled to a standard photo size. As our image is not going to be printed, we will leave it where it is. The actual size of my photo is currently 366 x 234 pixels. I can change the size here, or in the resize menu. This is useful if you need the photo to fit in a specific space. 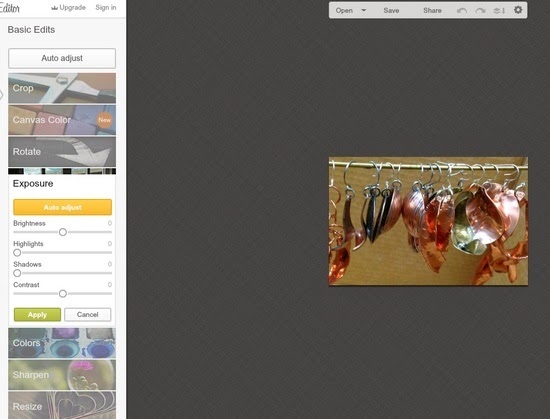 Keep in mind that if you do not click the “scale photo” box, the program will stretch the photo to fit your dimensions. This can have a carnival mirror effect that can be a lot of fun or give you a big headache! We do not have a specific size, at the moment. We just want to get rid of part of the photo. When we selected the Crop menu, a grid showed up on our picture. The grayed out area is what we are cutting away. We can increase, decrease and move around the edges by clicking and dragging with our mouse. When you find something you like, click the green apply button. Once cropped, you may find your photograph needs some minor adjustments. For example, under the Exposure menu, you can adjust the brightness and contrast of the picture, by sliding the circles on the bars. You may need to make huge adjustments, or just minor tweaking. Do not be afraid to play—you will get a preview of what you have done, but nothing is permanent until you hit apply. Similar adjustments can be made under the Colors and Sharpen menus. These three menus will most likely not alter the integrity of your work, but they can resolve minor issues due to poor lighting or a difficult subject. Let’s talk about the Effects, Borders, and Textures Menus. Many of these options are not available unless you sign up for a Royale account. I’m not going to tell you whether you should or should not sign up. 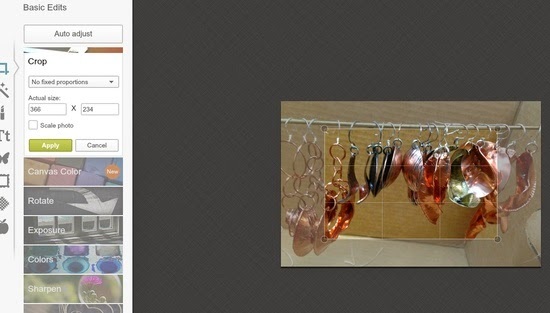 I don’t recommend using these for product photos as they detract from the item you are selling. However, there is room for some playing in a Facebook Banner. The menus work the same way as in the previous step. Each choice comes with adjustments you can make it uniquely your own. For example, in the above screenshot, I chose “Dark Edges” under Effects. The default uses black; however, I can choose any color in the provided spectrum for the edges (I chose teal as it compliments the copper nicely). I can also adjust how much of the edges are darkened, the amount of fade, and the intensity. Do not be afraid to play with these adjustments, as you can come up with some interesting effects. Nothing is permanent until you apply, and as always, remember to save often with a new file name, as it is easy to revert to an earlier saved version if you do something hideous! 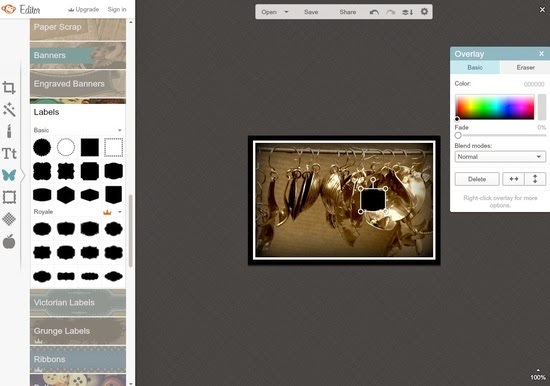 If you venture into Texture overlays, you will find more options than in other areas. 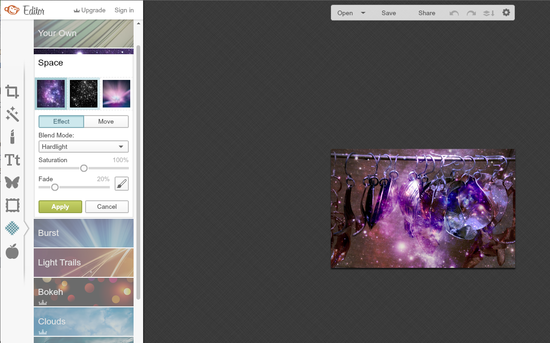 For example, under “Space,” there are three different options, depicted in three pictures. In the screen shot above, we are in the Effect submenu; however, if you click the “Move” button, there is another submenu where you can move the effect around by clicking the different buttons. **Keep in mind that we plan to create a photo collage. Write down the effects you use for your first photo as you will want to be consistent with your other photos. So here it is…so far. I chose to apply Sepia tones and dark edges from the effects menu and a Simple Edge from the Frames menu. Let’s talk Type and Overlays, because they are applied the same way. The Overlay menu (the Butterfly) has a wide selection of clipart, and I am going to choose a label. Once my label is placed, I will place type over it. I chose my label, which appeared in a random location on my photograph. A pop up menu also appeared to the right (it may pop up someplace else on your screen) The label itself came with a white lined box with 5 handles. The middle handle will allow you to rotate the label by dragging it with your mouse. The other handles will allow you to change the size if the label. If you click in the middle of the label, you can drag it to the desired location. You can stretch the label by holding the shift key at the same time as you click and drag on the handles. You can change the color in the pop up menu. 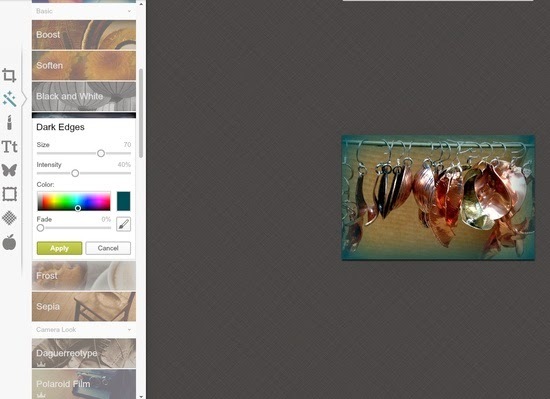 When you are pleased with the result, click outside the label and the handles and pop up menu will disappear. You can make them return by clicking on the label. Now go to the Type menu and choose a font you like. Select it and click “Add Text” at the top of the list. A text box shows up with similar handles, that work the same way. 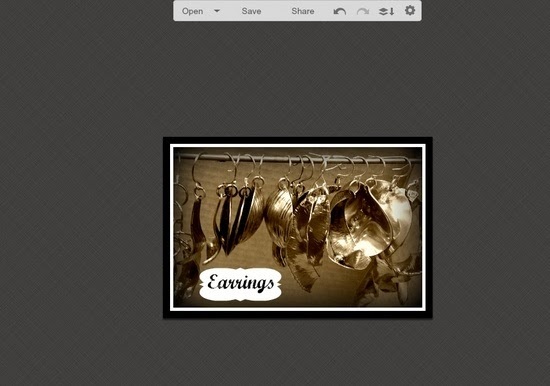 A pop up menu appears, where you can change the size, alignment and color. Click in the text box when you are ready to type your text. You can highlight your typed text to make any adjustments. If you haven’t been saving all along, you should save now. There is a middle menu at the top of your screen where you can hit save. Make sure you save it as a .jpg, and you remember where you saved. Repeat this process for a few more photographs for our photo collage. Stay tuned until next week, when we will create the photo collage for the banner. We will also upload it to our page. I hope you are having fun!